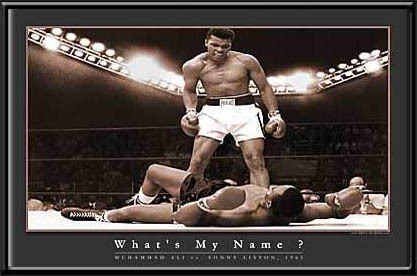 Muhammad Ali "What's My Name?" Sonny Liston was a top contender in the heavyweight division. He refused to address Casius Clay by his new chosen name.... "Muhammad Ali". He paid the price for his insolence in the first round of this bout with 'the Champ' in 1965. Picture Lighting Effects: Mini Light Bulbs illuminate overhead stadium lights.